Note: The Quadram Institute houses Quadram Institute Bioscience as well as the Norfolk and Norwich University Hospital’s regional endoscopy facility, and the Clinical Research Facility. 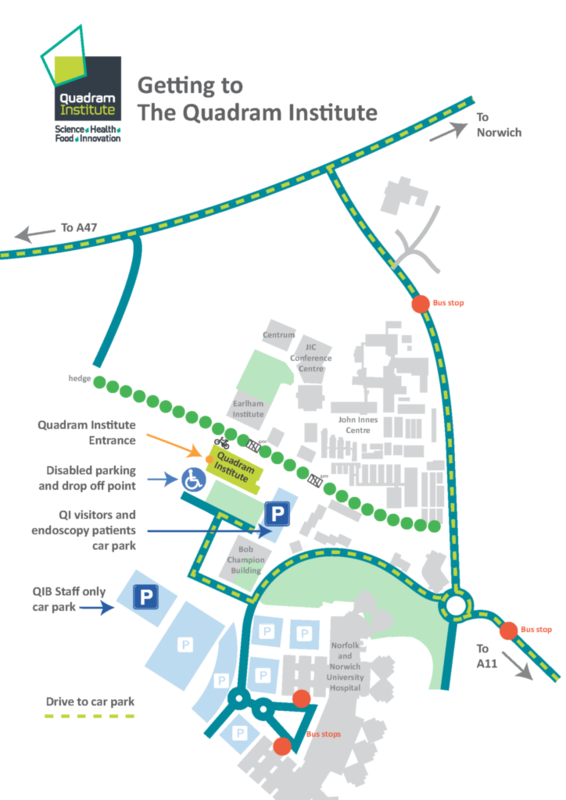 The Quadram Institute is close to the Norfolk and Norwich University Hospital (NNUH) on the Norwich Research Park, behind the Bob Champion Research and Education Building. If you are heading to the hospital by car, follow the signs for ‘Outpatients’. James Watson Road is on the right, opposite the NNUH Emergency Department entrance. Parking spaces for visitors are at the Quadram Institute and fees are the same as public parking on the NNUH site. Disabled parking spaces can be found near the public entrance and there is also a drop-off zone. Parking for motorcycles and bicycles is also available. The hospital is served by the Park and Ride bus at Costessey (service 510). These bus services also stop at the NNUH: First 11/12, First 21, First 26, Konect 3, Konect 4, Konect 9. The nearest bus stop is outside East Outpatients at NNUH. The Quadram Institute is a 500 metre walk following the footpaths past the East block of the NNUH and past the Emergency Department. Cross the road towards the Bob Champion Research and Education Building and follow the footpath to the Quadram Institute.